FLORENCE, S.C. – Betty Gregg had a simple message for those looking to cause trouble in the soon-to-be revamped Dr. Iola Jones Park: Stay out of the park. Gregg spoke at a ceremony Tuesday afternoon to break ground on the construction of community center at the park. She has campaigned for several years to get the center. She added that those attempting to do something illegal in the park would receive a visit from the Florence Police Department. She said the city has given too much money for the park to not be taken care of. Gregg also said the community center was needed because sometimes residents in north Florence don’t have the ability to travel between their homes and other parks with community centers, such as Northwest Park. A member of the youth community, Taon Murray, also spoke at the ceremony along with Florence City Councilwoman Pat Gibson-Hye Moore, Roger Malfatti of the city’s parks commission and Florence Mayor Stephen J. Wukela. The groundbreaking at Dr. Iola Jones Park was the second of two groundbreakings Tuesday afternoon in Florence. 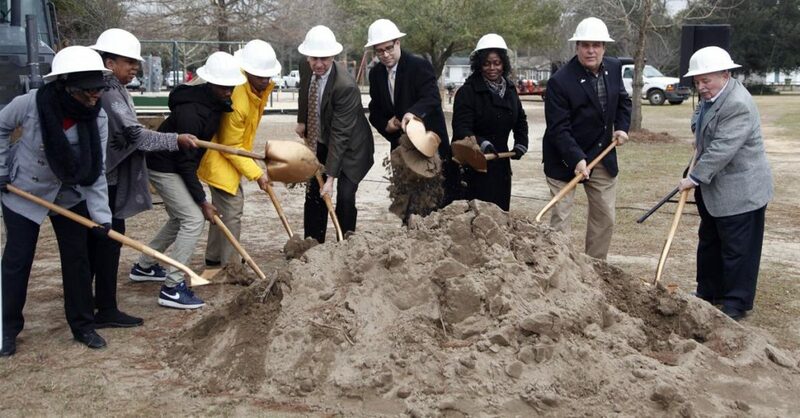 The city also broke ground on a community center to be constructed at Maple Park near downtown. Bonnette said she hoped the park would restore the vitality of the Maple Park neighborhood in a way similar to the revitalization of the city’s downtown. Florence City Councilwoman Teresa Myers Ervin, Wukela and Malfatti also spoke at that groundbreaking. The community centers are expected to be similar in size to the existing community centers at Levy and Northwest Parks. The Dr. Iola Jones Park and Maple Park community centers will each consist of approximately 4,480 square feet and include a large youth activity space, youth lounge, computer room, office space, restrooms and storage space. Each center will also include a senior adult activity area as well as a small kitchen. Construction is anticipated to begin in February, and it will take approximately eight months to complete. The Jones Community Center also wil include an 800-square-foot area connected by a covered walkway to the Community Center that will be used as a boxing space for an established youth and young adult boxing program. Other improvements at Dr. Iola Jones Park include construction of additional parking at the new center; rerouting a portion of the existing asphalt trail and resurfacing the entire trail; and repairing, sealing and striping the existing parking and basketball courts. The city is using funds from an October 2017 bond issue to construct the new centers. The bond issuance raised $15 million for recreation and athletic capital improvements. Approximately $2.5 million of the money will be used to construct the centers. FBi Construction will build the centers and Collins and Almers Architecture is the architect.